I recently placed an order with the Etsy shop Fabulously Planned. This is my third with the shop and the quality never ceases to amaze me. I placed my order on October 26th during the 50% off sale, but it took 3 weeks for me to get it. I never had a problem receiving stickers from this shop, but the process did take a bit longer than I expected. I ordered two weekly kits, a Christmas countdown, gas stickers, and received a Thanksgiving sampler sheet. The two weekly kits I will be using throughout December. One is a traditional Christmas set which I’ll be using the week of Christmas. The second set was roses with the color scheme. My mother’s birthday was December 10th and I decided to dedicate a layout to her. Roses for Rosa. I was debating on whether I wanted to use the Christmas countdown in the monthly spread or my weekly view, but it’ll fit nicely at the bottom of each day throughout my weekly spreads for the month. The gas sticker sheet was a huge surprise based off how big the sheet was. I also like that these gas stickers had the dollar sign already on them. The size plus the variety of colors will make them easy to use in any spread in both my monthly and weekly views. As for the bonus sheet, I’ll be using the Thanksgiving sampler during Thanksgiving week. Fabulously Planned reopens on Black Friday. Be sure to follow Fabulously Planned on Instagram for latest updates & sales. Happy Mail | Pineapple Paper Co. I was lucky and fortunate enough to be chosen as a PR member for the Etsy shop Pineapple Paper Co. There are a lot of changes that are happening with the brand and I’m excited to share what’s to come with the shop here on the blog and on my Instagram, @chaoticcritic so be sure to follow along. I wanted to share the welcome package with you all since I’ll be using the stickers in my upcoming plan with me. 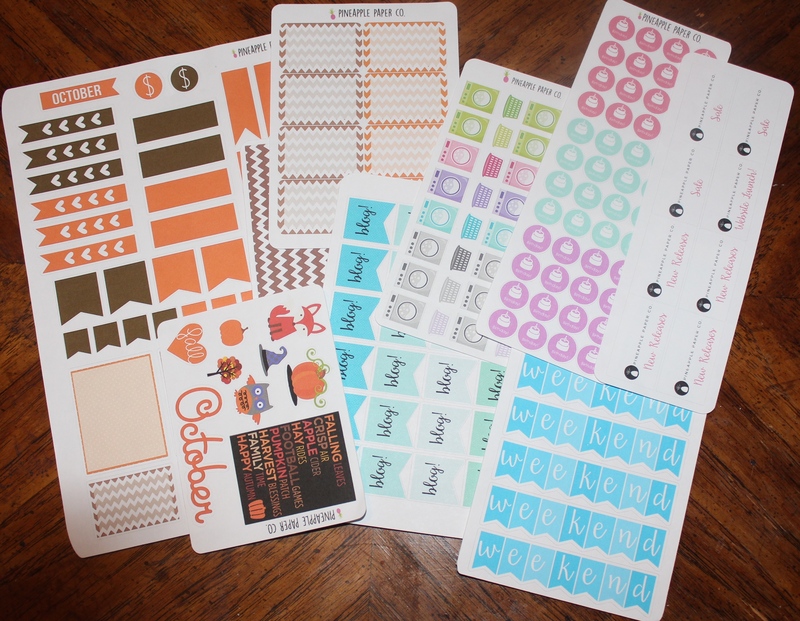 The owner, Lizzy, sent 8 sheets of stickers and I cannot wait to use them. The layout for the upcoming week will be the fall sampler sheet along with the full and half boxes. 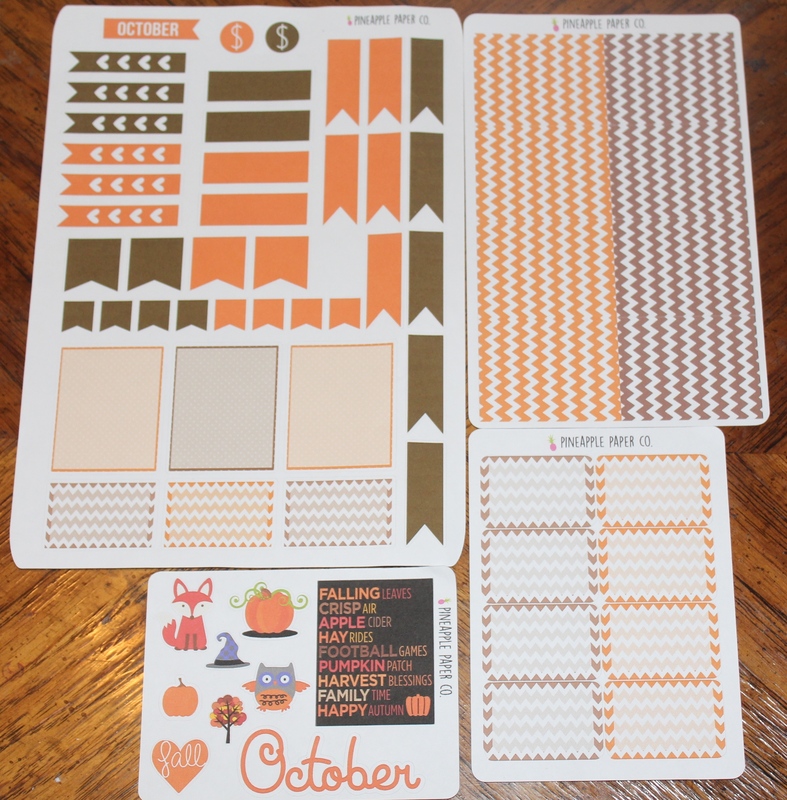 I went back and took some of the October sampler stickers and put them in my previous weeks. I did a previous fall layout for the week of September 21st-27th, but another orange and brown layout should be interesting. Also I’ll be using a Chevron print in the following week (11/9 – 11/15) for a Lung Cancer theme so that’ll be fun. Opposed to other samplers, this one is pretty basic. It doesn’t have icons, but if you have icons or want to draw your own in you can. There’s also no weekend banner, but the sampler is versatile for the month of October as the sheet says, but works well in November as well. Don’t limit yourself to using a sampler for a specific month. Spread out your colors and have fun. 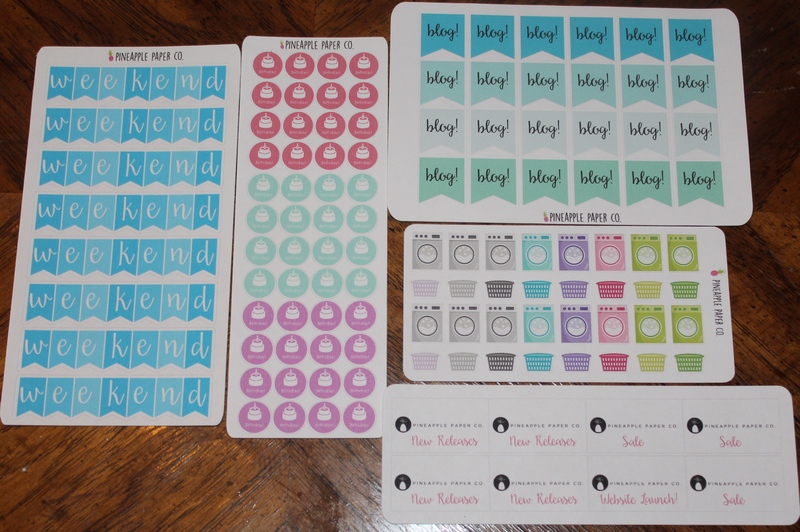 The other stickers that she sent will be great for when I do “blue/teal” layouts; especially the weekend banners. the blog banners I’ll try to fit in with my current layouts, but use the fainter blue shades. You’ll also see the updates for the shop throughout my layouts with the stickers sent. Lasty I love the birthday cakes, but my favorite is the laundry sheet. For those that love big stickers or little ones, you get the best of both worlds with this sheet. Also having an array of colors makes easier to apply to any layout. Stickers such as laundry and birthday, even trash cans and TVs, are great to have on hand because you know that you’ll use them. I really love that this laundry sheet comes in the two different sizes.